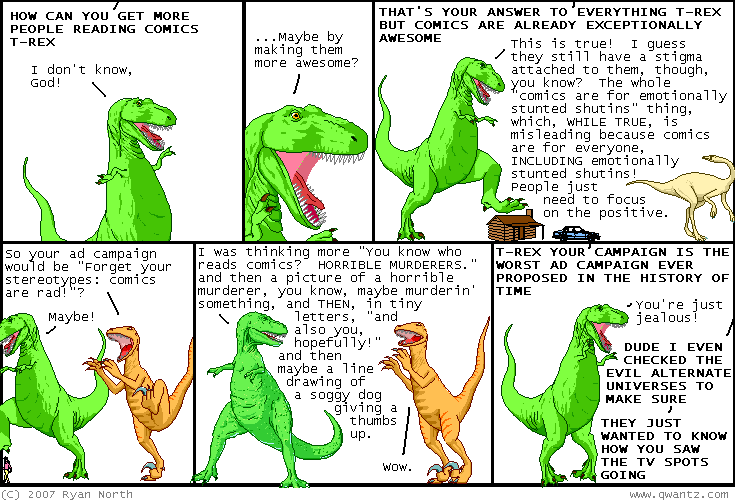 Dinosaur Comics - May 7th, 2007 - awesome fun times! May 7th, 2007: I hope everyone who made it out to Free Comic Book Day had a good time! It was great at The Beguiling in Toronto and thanks to near-constant sunscreen usage, I did not even get burnt. Sorry to everyone who got a sunscreen-greasy handshake! Normally my handshakes are like ice: cool, firm, and refreshing. Also there's a lot of them at the poles. Penguins live on them. Scott McCloud gave a talk yesterday in Toronto and it was really interesting and engaging - not to mention the introductary talk given by his daughter, Sky! The whole family is on a 50 states tour, so while if you're in the US the odds are that you've already missed out as they are on state 32 thus far, the odds are also pretty good that there is still hope and you could see a really interesting talk on the nature of comics. Scott will be at The Beguiling tonight at 6pm to do a signing, and if you're in the city I recommend you drop by!